Red Snapper is a beautiful fish and this simple preparation showcases its wonderful flavour and texture. 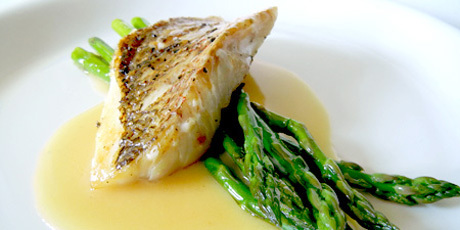 A simple lemon beurre blanc and some sauteed asparagus is all the accompaniment you need to make a delicious dish. Beurre blanc is a classic French butter sauce made with shallots and white wine. Its rich and tangy flavour is ideal for serving with fish. 1. Bring a large pot of salted water to a boil & prepare a bowl of ice water. Cut the bottom inch off the asparagus. Cook the asparagus in the boiling water for 3 minutes and then transfer to the ice water. 2. In a small sauce pot, combine the white wine, shallots, black peppercorns and lemon juice. Bring to a boil and then reduce the heat to a simmer. Let simmer and reduce until only 2 tablespoons of liquid remain. Strain, discard the shallots and peppercorns and return the reduction to the stove on minimum heat. Whisk in 120g of cold butter, one cube at a time, whisking constantly. Wait until the last cube is fully incorporated before adding the next. Do not let the sauce get too hot or it will separate. If the butter starts melting too quickly, remove from heat and whisk for 2 minutes before continuing to add the butter. When all the butter is incorporated, season with salt and keep in a warm place. 3. Season the snapper fillets with salt & pepper. Heat 1 tablespoons of butter in a large non-stick frying pan and add the snapper fillets skin side down. Gently press down each fillet with a spatula to prevent curling. Sear on medium heat for 6 minutes, then turn the fillets and cook for one more minute. 4. Heat 1 tablespoon of butter in a frying pan and sautee the asparagus until warmed through, about 3 minutes. 5. To serve: Divide the asparagus among 4 plates and then spoon the beurre blanc over the asparagus. Place one fillet of snapper in the center of each plate.